Besides loving and playing the traditional musics of Asia and elsewhere with some very non-traditional instrumentation, he also uses Asian tools to build music with the compositional advances and new concepts of jazz and 20th-century music -- Stockhausen-type tone or timbre rows developed in Indian composition/improvisation structures, atonal and/or non-octave ragas, stochastic tala structures, ragam-tanam-pallavi leadsheets, and shakuhachi and gagaku pieces transmigrated into 21st-century bodies. Joe can be heard in his regular booking at Viracocha (21st & Valencia, San Francisco) on Wednesday afternoons as well as various Bay Area venues. 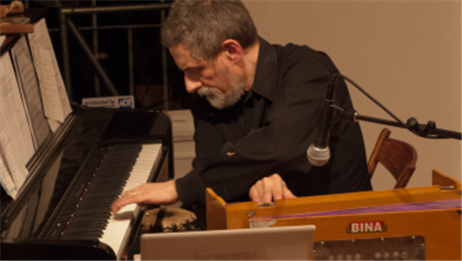 He has recently released an album, Turquoise Sessions, of modernist piano interpretations of ancient Indian and Japanese musics.